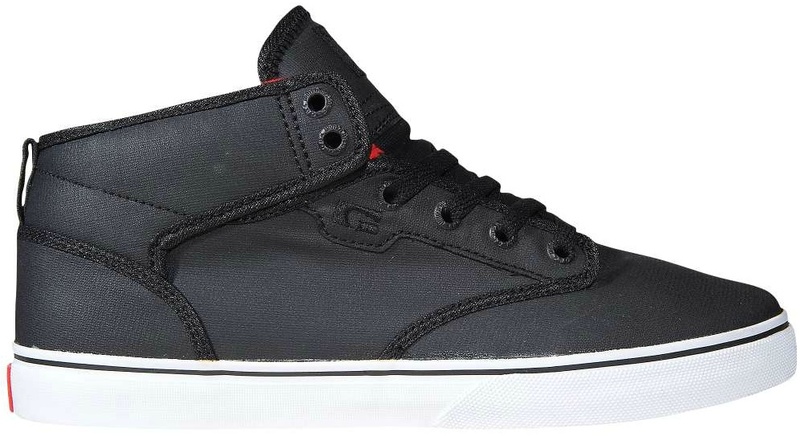 Globe Motley Mid is back for Fall 12 in another Vegan Colorway! Black and a little red for your Anarchist soul! This time around it comes in a waxed canvas upper which holds up better on the skateboard then last season. The collar and tongue have a nice bit of padding to keep your feet protected. The inner-side of the shoe (not pictured) has some eyelets to keep your feet breathing. The vulcanized rubber sole will give a good board feel and is red to match the lining. Bought these online from Cowtown based largely on your write-up here. They just arrived today and, I’ve gotta say, I like these shoes a lot. They’re built really well, seem pretty true to size, and are a little on the wide side (which is great for me). Cowtown got ’em to me fast, too. Thanks for the great tip on these – I’m a new fan of Globe.